My reasons for choosing Brigid as the focus for my project are threefold. The first is that I come from Irish ancestry so have a natural connection with Celtic culture. The second reason is that She is inspirational to me, her bright flame draws me, helps me to shape my life. I love her connection to fire, creativity and to healing and protection. My third reason is that I have a deep personal connection to her; my birthday is near Imbolc, Her time for celebration. She is Goddess of Druids and Bards and I have walked the Druid path for many years. She is Protectress of Mothers and Children and much of my life has been of mothering and children. She is also Goddess of Seers and for much of my life Divination has been a part of my service to Goddess and humanity. Brigid has Her origins in Irish culture during the Iron Age of the Celts. But Her influence is widespread; with evidence of Her worship in France, Wales, Italy and New York. She is predominantly viewed as Irish. Legend tells us that she was one of the Tuatha de Dannan, daughter of the Goddess Danu and Dagda, who was known as the Good God. Her people were said to have come from the Otherworld, known for their magical powers, beauty and longevity, they became known as the Fair Folk. But there are many versions of Her story. One is that she is the daughter of the Dagda and the Morrigan, Goddess of War. 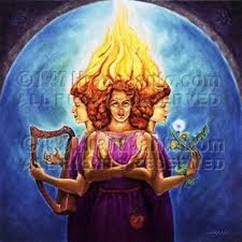 Another says Brigid and the Dagda chose to create order in the world and populate it with the Children of Danu. Though originally a pagan deity, Brigid was “adopted” by the Christian faith and there are a multitude of churches dedicated to the one they call Saint Brigid. She is also known as St Bride, Brid and Brigitte. As well as churches, spiritual groups, women’s groups and secular charities have all been set up in her name. Brigid is also associated with the Roman Minerva and British Brigantia. She is worshipped in all three of her aspects: as patron of poets, healers and smiths. She is Lady of the Eternal Flame, Lady of the Waters, Goddess of Druids (who themselves echo Her triplicates in their grades of Bard, Ovate and Druid). Brigid is Goddess of healing, battle, leech craft, love and death. She is Goddess of the Forge and of metals. She is Goddess of Painters, Poets and Prophets and Seers. She is Goddess of the Oak. She protects children and challenges authority. She is Mother and Midwife. Her name means Bright One or Exalted One. She uses the elements of fire and water, she creates, destroys and regenerates. 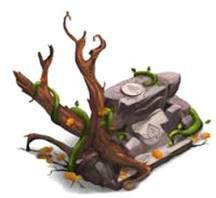 She is worshipped at holy wells in a variety if rituals which may include lighting a candle, reciting a prayer, walking in a pattern, giving an offering or drinking of the holy water. She is at the core of the Druid Imbolc celebrations as The Light on the Waters, blessing the snowmelt with her powers of healing and renewal as Spring slowly emerges from the frozen time of Winter’s darkness, allowing all life again and the milk of nature’s kindness flows once more over the Earth refreshing and renewing all life. She is probably known best of all as the Keeper of the Eternal flame. As well as signifying the need to perpetuate life, in this role. She also motivates us to keep our personal flame burning, so whatever challenge life may throw at us we have the strength to carry on, for it is only by doing so and nurturing the eternal quality of Spirit that we can achieve our full potential. 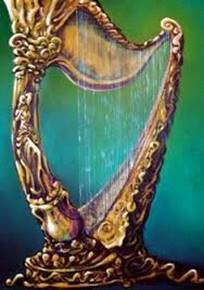 The Harp is a primary symbol of Brigid. She plays the music of the Divine to inspire our souls to create. She is the Muse that calls us to let our inner light shine out, to reach deep into our spiritual source and bring forth it's beauty in whatever artistic form is right for the individual. As the Goddess of Smiths, her symbol is the Anvil. The Anvil uses the element of fire to define and shape who we have the potential to be. It is a heavy tool and can be dangerous, but inviting Brigid to shape us with her Anvil can bring forth unrealised potential and creative transformation. 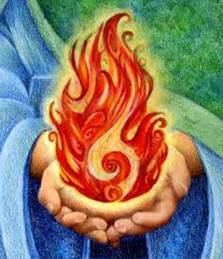 But do not expect this process to be easy, Brigid gives us challenges to overcome that we may become strong and true. 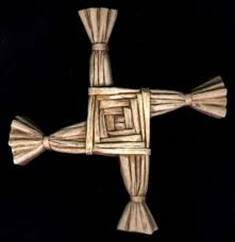 Brigid’s cross is probably Her best- known symbol, it is made of rushes and originally a pagan Sun symbol that has been co-opted by Celtic Christianity. The cross has rites and myths associated with healing and protection, it is also a symbol of Brigid in her fertility aspect; She who blesses the crops and the livestock, Brigid, who is Mother and Midwife to all beings on Earth. The Cross represents our nurturing aspect, as we tend to hearth and home, keeping the eternal flame of life burning on Earth, turning with the cycles of Nature through birth, growth, flowering, decay and regeneration. 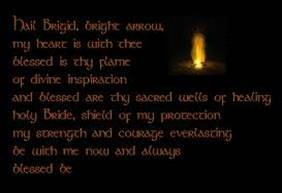 Other symbols of Brigid are her Cloak- also a symbol of Protection, the Hawthorn, symbol of fertility, and the Oak Flower, blossom of the tree of wisdom. Her flowers are snowdrops and crocuses and the three-leafed shamrock symbolises Her place as a triple Goddess. This ritual is one to be celebrated at Imbolc when the Lady of the Flame comes to cast Her light upon the waters and melt the ice. Intention: To align myself with Brigid's energy to renew, reshape and inspire. White candle at the centre of my circle for Imbolc and 4 red and 4 orange tea lights for her flames. Self-blessing: adding at the end: I dedicate myself to work in Her name for the highest good of all, may none be harmed, so mote it be. water into my garden so the energy of my ritual is poured into earth.